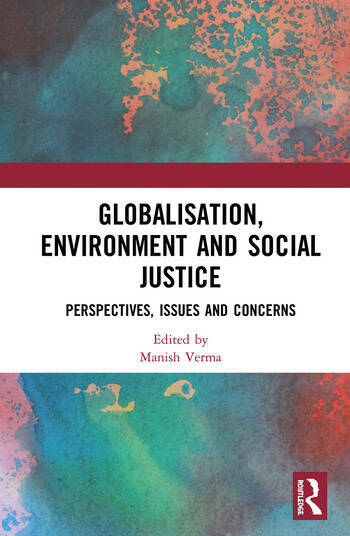 This volume provides a comprehensive account of the connections between globalisation, environment and social justice. It examines varied dimensions of environmental sustainability; the adverse impact of globalisation on environment and its consequences for poverty, unemployment and displacement; the impacts on marginalised sections such as scheduled castes and tribes and women; and policy frameworks for ensuring environmental sustainability and social justice. The chapters build on detailed case studies from different parts of the world and deal with critical environmental issues such as global emissions, climate change, sustainable development, green politics, species protection, water governance, waste management, food production and governance besides education, inclusivity and human rights. Presenting a range of topics alongside new perspectives and discourses, this interdisciplinary book will be useful to students and researchers of political studies, sociology and environmental studies as well as policymakers and those working in the government and civil society organisations. Manish K. Verma is Professor, Head and Deputy Coordinator of the UGC–Special Assistance Programme in the Department of Sociology at Babasaheb Bhimrao Ambedkar (Central) University, Lucknow, India. Previously he served in the Department of College Education, Rajasthan, as Lecturer, Senior Lecturer and Lecturer in Selection Grade for 10 years and briefly at NTPC, Corporate Office, New Delhi, as Sociologist. With a doctorate from Jawaharlal Nehru University, New Delhi, he has more than 22 years of teaching and research experience. He has published many books, including Globalisation, Social Justice and Sustainable Development in India (2017), Peri-urban Environment (2017), Globalization and Environment: Discourse, Policies and Practices (2015) and Development, Displacement and Resettlement (2004). Several of his research papers and chapters have been published in journals and edited volumes. He is a member of various professional bodies such as the International Sociological Association, Indian Sociological Society and Rajasthan Sociological Association. At present, he is a member of the Managing Committee of the Indian Sociological Society. His main research interests include environment and development, involuntary displacement, urban ecology, social justice and globalisation.